Jacó, Garabito – Announcing a price drop on CR-BEACHFRONT 9th Floor! Jaco Absolute Beachfront 2 Bedroom, a 1,754 sq. ft., 3 bath, 3 bdrm single story. Now $425,000. WILL NOT LAST! • 1,754 sq. ft., 3 bath, 3 bdrm single story – $425,000. WILL NOT LAST! Jacó, Garabito – These beachfront Jaco, Costa Rica condo units have such incredible ocean views that you’ll spend the majority of the time on your over-sized balcony gazing out onto the endless expanse of the Pacific, thinking “I have finally arrived!”and “I can’t believe the deal I got on this condo”. This 9th floor unit features a spacious layout with three beautiful bedrooms, and jaw-dropping views from every room. Please call me or write me and I will get you the specifics and all updates as soon as possible. The beach below (north beach) is one of the best sections in Jaco, with soft sand, and a gentle slope down to the waves below. Ownership in these condos also includes private entry and all access to the incredible pool, casino and restaurants at Croc’s Casino Resort, a 55 million dollar development which is located right next door. This development is a 10 story, 33 unit building with unobstructed ocean views from every room, an onsite management office and secure parking. There are also groves of shady palm trees and you are right next to the brand new 50 million dollar Vegas style Casino Resort called “Croc’s (Grand Opening was February 2015). Current monthly Condo dues are $700 dollars a month, which includes a membership for you and your guests at Croc’s Casino, which allows you to exclusive rights to utilize the use the Croc’s common area and massive pool. Your monthly fee can easily be covered by renting your unit out for only five days a month if needed! This condo is tastefully furnished with high end furniture and appliances, due to it’s premium location this building has an excellent and consistent rental draw as well as potential for quick appreciation. There is condo management company available as well as management services for you and your guests. Call me or write immediately, this WILL NOT LAST. Esterillos, Garabito – YOU WILL LOVE THIS PROPERTY!This is an excellent opportunity for a fantastic property just 500 meters to the beach and at a rock bottom price from a super motivated Seller. I was involved in the lot acquisition and building of this home and the homes on each side, and am excited for the right person to enjoy this beautiful property that I believe to be one of the best finds in the Central Pacific! Lot is spacious at 1300 square meters (14,000 square feet), and home is approximately 2300 square feet. The backyard has one of the best pools in my inventory, it’s huge! And it’s deep enough to keep the water cool for a refreshing dip. 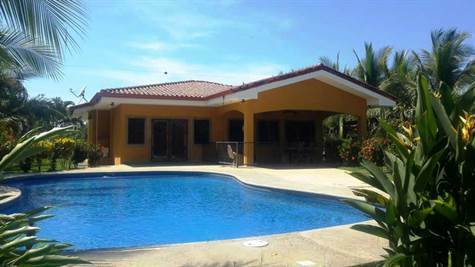 This 3 bedroom, two and half bath, house is in excellent shape, was built in 2007, and features steel reinforced concrete block, Spanish colonial iron work, high end super sturdy furnishings and appliances, huge ceramic tiled pool and is located in a quiet, country-esque setting just 500 yards to the beach at Esterillos. House has a detached, huge storage bodega, super secure and useful, with room for a large SUV and all your gear, this bodega is large enough to be converted into another living space if needed. Everything is included in the sale (minus some personal belongings), and has a property manager living next door (as needed). This house is located just a few minutes off of the Pacific Coast Highway and at the end of a country road that winds through beautiful pastures and tranquil pastoral scenes. There are a few nice homes on this road and beach is located about 500 meters from this house. You can hear the waves and enjoy the ocean breeze, enjoy the huge swimming pool and large covered backyard BBQ patio area. Property is located 15 minutes (drive times) south of Jaco and 15 minutes north of Parrita. There is a brand commercial center with grocery store and gym within two miles as well as restaurants and bars, yet home retains its “country living” feel of peace and seclusion. This area is growing and appreciation at this “MUST SELL” price is guaranteed. Call me or write immediately this opportunity will not last. .
Well, a loin cloth would probably be the most comfortable, but you might offend the monkeys. But what I can tell is that you can and will go pant- less every day, 365 days a year! So there is really need to bring any pants (unless it’s very lightweight material), or long sleeve shirts (except to protect from the sun), or clothing of heavy material as it is warm and humid year round. Just think, no jackets, suits, gloves, heavy socks and footwear, long underwear or head gear. Seriously folks, this is the tropics, think light weight linen, sandals or tevas, tank tops and swimsuits. WHAT ABOUT EXPENSIVE DESIGNER CLOTHING/JEWELRY and SHOPPING? Unless you want to go out on your yacht or have some reason to “dress to impress”, you will not need to bring “impressive” style brand name jewelry or clothing as nobody here really cares about that anyway (what a relief). Most brand name clothing and accessories are more expensive in Costa Rica and difficult to find here on the coast, so don’t plan on going shopping here, unless it is local boutique shopping, where you may find are some very nice stores with tropical style clothing and jewelry.